COMP Cams Cast Aluminum Valve Covers - Pann Auto Performance - San Diego largest aftermarket automotive performance parts - What do you drive? Manufactured and packaged in the U.S.A., this line of powder coated die cast aluminum valve covers will provide a sleek, high-performance look combined with rigid durability and unmatched reliability. They are a perfect addition to any high-performance engine. 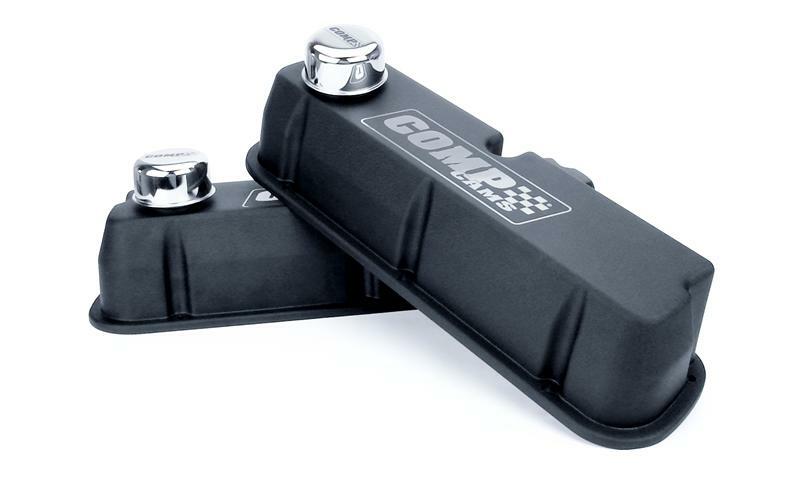 These valve covers are perimeter bolt style and include two chrome breathers with laser etched logos, two black rubber grommets and installed baffles. The installed baffles are welded in place to ensure no oil enters the breathers. The chrome breathers are present on both valve covers which allows for proper crankcase ventilation. In addition, these covers were designed to be tall enough to provide the necessary clearance to accommodate aftermarket valve trains. The line currently includes applications for Small Block Chevy, Big Block Chevy and Small Block Ford engines. Gaskets are not included.